The Planet Killer is a massive Chaos starship that served as a flagship of Abaddon the Despoiler during the Gothic War and the 13th Black Crusade. The vessel owes its power to its main weapon, the Armageddon Gun, which can destroy an entire planet. Sometime after the 10th Black Crusade, Abaddon discovered an ancient shipyard deep within the Eye of Terror. There, he discovered a half-constructed vessel. This was the original origin of Planet Killer. Another perhaps contradictory account states that in 978.M40 Abaddon toppled Lord Teknos, ruler of the renegade forge world Baji IV. Teknos’ tech-priests followed Abaddon into the Eye of Terror, where they began construction of the Planet Killer, using data recovered on the halo world of Lanamorgstein. The construction of the Planet Killer was finished in 139.M41, shortly before the launch of the Gothic War. In a ritual, sorcerer Zaraphiston bound several daemons to the vessel in order to decrease the needed manpower on board. he Planet Killer played a crucial role during the Gothic War. Once the vessel was fully operational and manned, it followed Abaddon and his forces into the Gothic Sector where it acted as the Despoiler’s flagship. The destruction of Savaven: Abaddon first demonstrated the Planet Killer’s devastating main weapon on the Cardinal World of Savaven, with the account from one of the orbital defence commanders describing continents splitting apart, burning skies and the planet breaking into pieces. Sources indicate that 14 million people died within an hour and effects on imperial morale throughout the sector were crippling. The submission of Saviour: In order to save the lives of the eleven billion inhabitants of Saviour, the commander of the planet agreed to produce ships for the Chaos fleet. The destruction of Stranivar: The Planet Killer destroyed all three moons of the hive world Stranivar. The debris of the moons devastated large parts of the surface. During Abaddon’s 13th Black Crusade the Planet Killer was used to destroy the worlds of Macharia (Obscurus) and Urthwart. The assault on Arimaspia: Abaddon left the Planet Killer under the command of Malefica Arkham, who was supposed to launch a diversionary attack against Arimaspia. Arkham succeeded to destroy two of the five planets in the system. Abaddon himself used a captured Blackstone Fortress to move against the real target, Schindlegeist. When the Despoiler was ultimately driven back, Arkham was left on his own. With the Planet Killer at his disposal, Malefica Arkham decided to create his own empire. At first he was successful and conquered Gonnacrash and Quinrox Sound, but as he moved the ship to Kharlos II he faced the four Lunar class cruisers of battle group Omega. Without any other vessels to support him, the Planet Killer was reportedly taken out by continuous torpedoing. There have been many rumoured sightings of the Planet Killer throughout the 13th Black Crusade. Whether it is the original salvaged ship or a new ship is unknown. Built around a central energy cannon of immeasurable magnitude, the Planet Killer is also studded with numerous long range lances, weapons batteries and torpedo launchers. Well armoured and protected by a plethora of shield generators, the ship’s only weakness seemed to be its ponderous speed. It was this lack of pace which was to lead to its eventual downfall, as it was destroyed by salvo after salvo of torpedoes, fired at extreme range by the Lunar class cruisers of battle group Omega, shortly after the destruction of Kharlos II. The origins of the Planet Killer are a mystery to Naval authorities. 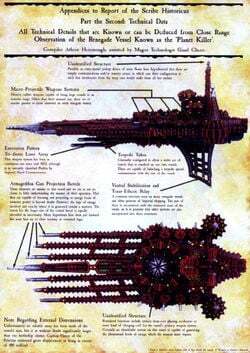 It bears no resemblance to any Imperial ship design and is assumed to have been constructed within the Eye of Terror by Abaddon’s forces, just prior to the Gothic War – in fact several of the Adeptus Mechanicus doubt whether its construction would have been physically possible outside of warp space. ~ Astropaths report a possible vision of the Planetkiller in the aftermath of the Vigilus invasion.